Hello. My name is Brain Pincombe and I run Durdon Farm along with my wife Glynis.We’ve been farming here since 1984, converting to organic in 1991, and started to supply milk for Kingdom Cheese in 2014. 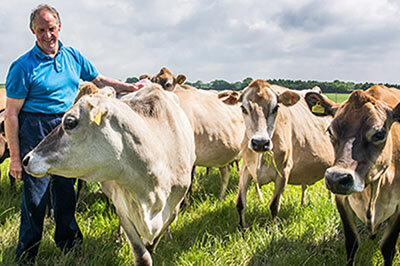 We milk around 100 Jersey’s, on a 200 acre dairy farm, which live outside for up to 10 months of the year, grazing on the lush, rich pastures of the Devon countryside . Our move to organic was important for health reasons as we believe that this makes for happier, more contented cows.